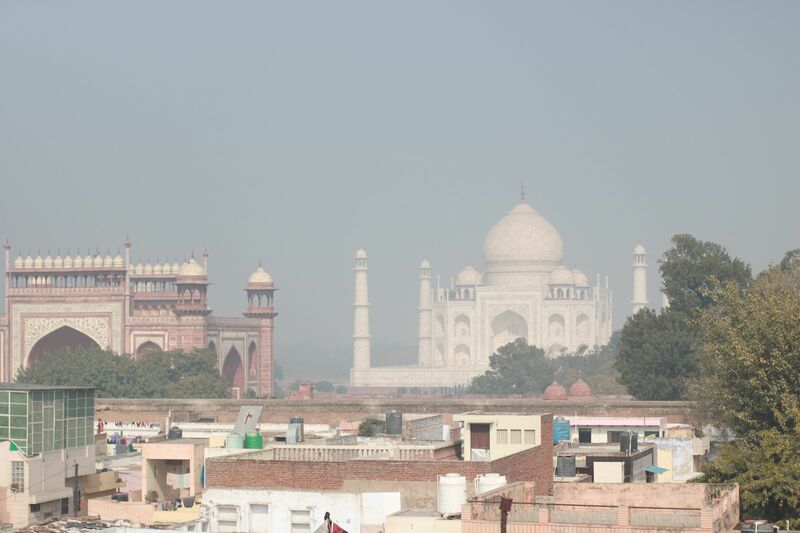 “Ma’am,” my co-passenger, a girl my age who had been audibly laughing while watching Friends reruns on her laptop, whisper-shouts to me, “Have you seen the Taj Mahal?” She is glowing. Immediately, I sober, snapping alert from a 15-hour rotation of sleeping and reading. I haven’t. Not yet, anyway. Together, we stare, star-struck, through the window at one of the new seven wonders of the world until the train slumps to a final halt. 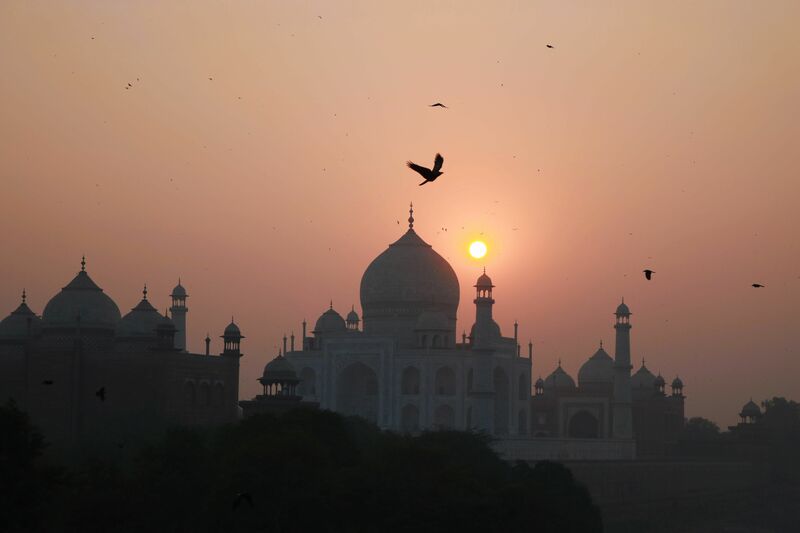 The Taj Mahal used to attract 70,000 visitors daily. 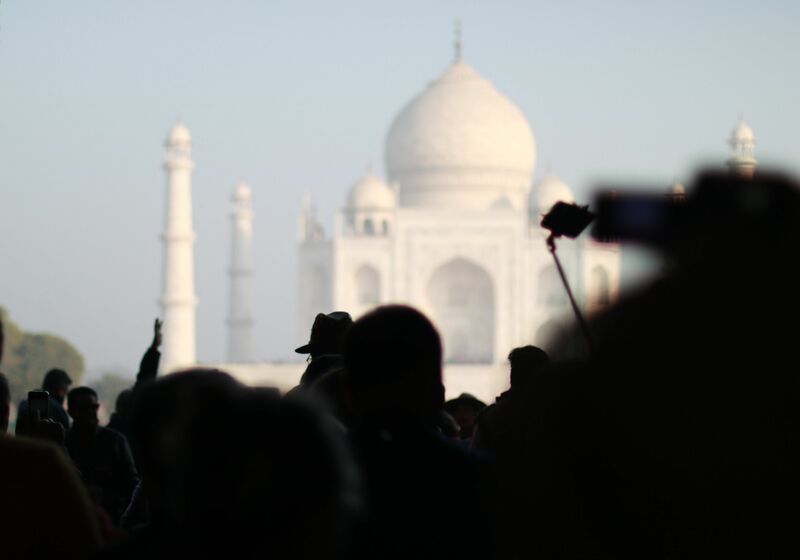 As of January 20th, a cap sets the number of Indian visitors over 15 years old to 40,000 a day, in two time slots. The new policy, enacted by The Archaeological Survey of India, cites environmental concerns and prevention of “stampede-like situations” as reasons for the limitation, according to The Times of India. The final verdict comes after findings from a study commissioned in 2012 recommend that the present number of tourists is stressing the load-bearing capabilities of the 17th-century architecture. There will be no limit for foreign tourists, who pay Rs 1,000, as compared to the nationals’ fee of Rs 50. The open-space roof gives way to an eye-level view of the Colgate-white mausoleum, flanked by the Royal Gate on the left, at the opposite edge of the city. I arrived at Saniya Palace at 9 AM and, in the two hours I sat, read, and sipped lassi, only a few of the tables filled up with foreigners. The second morning I came here to watch the sunrise (in vain), the server armed me with a baton to ward off the monkeys that, in his words, would take my valuables and run. The hotel lies between the East Gate and central Great Gate. The park is accessible from the city center by a 20-minute tuk-tuk ride for Rs 100. The expansive garden lies across the Yamuna River, facing north on the riverbank opposite the Taj Mahal. 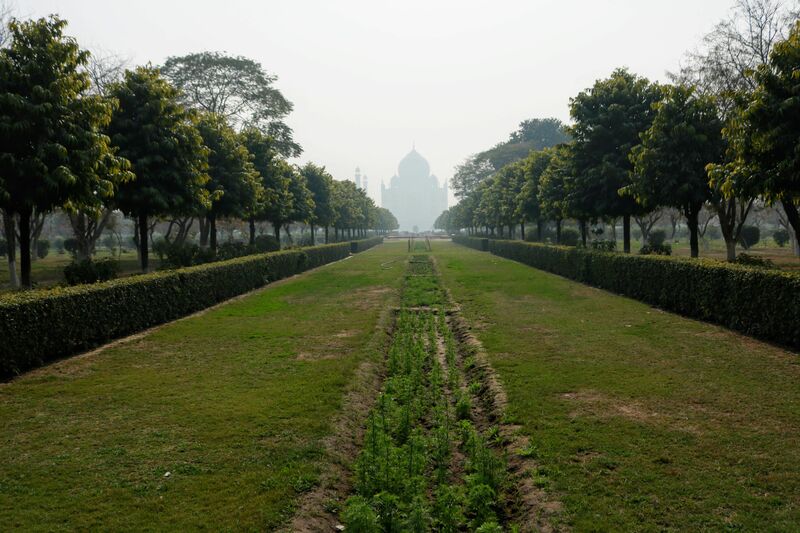 Entry to the Mehtab Bagh gardens costs Rs 200 for foreigners, Rs 20 for locals, and allows a vanishing point perspective of the massive structure. On the river behind the Eastern Gate, there is a one-man monopoly on the boating business, which has otherwise been banned entirely since 2002 for security reasons. 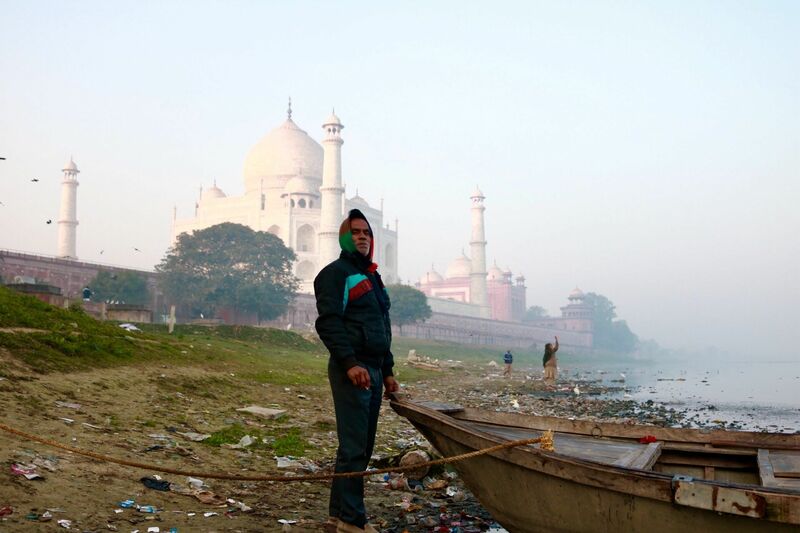 Manoj, who has a scarf tied over his head and ears in the early morning cold, has been working on this river for 30 years, bringing tourists on a 15-minute spin to the opposite bank to catch the reflection of the Taj in the water. Uniformed guards patrol the riverbank, shouting when they feel you are too close to the barbed wire, ten-foot-tall fence surrounding the perimeter of the palace grounds. Manoj defies the rule by paying off the guards, Rs 50 from every Rs 150 he makes. He works in the early morning and evening time and says he only gets about nine tourists a day, which gives you a picture how hidden-in-plain-sight this location is. To get there, walk right from the Eastern Gate, sticking to the left when the road splits. 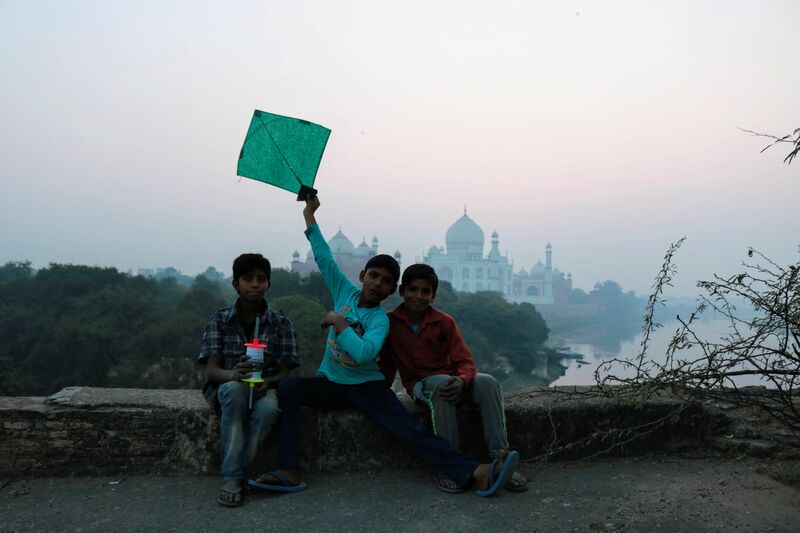 For a view of the Taj at sunset with the dome eclipsing the sun, head directly east from the Eastern Gate, yielding right at the fork, crossing a sand field of locals playing cricket and heading up towards the tower. According to my local host, it’s technically private property, but the government appoints an official that you must pay Rs 50 for entry. The only other people there are some locals drinking whiskey on the bottom tier of the tower and kids playing with a kite. Seeing the engraved and contoured marble up close, of course, adds another dimension to the astounding impression left by the palace, but if the tourist cap, an aversion to body-to-body crowds of people with their phones in the air, or a Friday keeps you from entering the palace, know that these different viewpoints offer something valuable. For more from Jenna Kunze, check out her blog here.